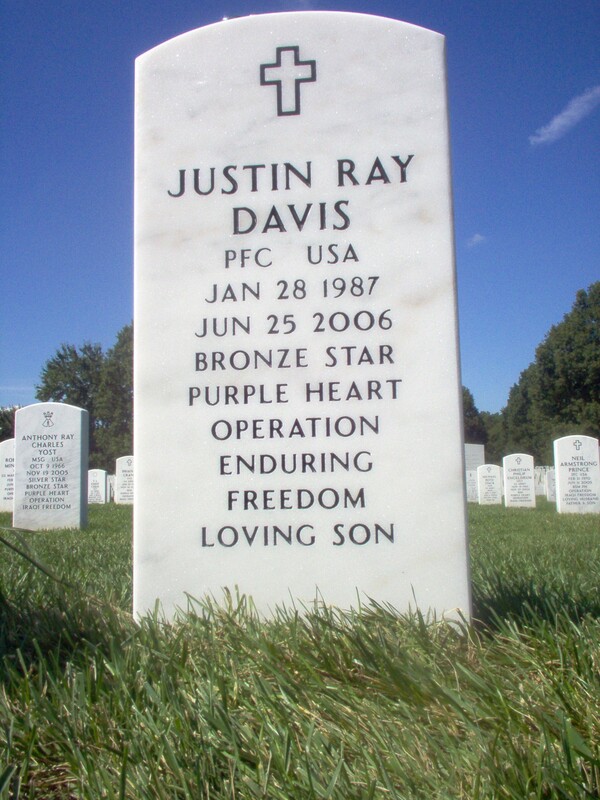 Private First Class Justin R. Davis, 19, of Gaithersburg, Maryland, died in Korengal Outpost, Afghanistan (near Kunar Province), on June 25, 2006, when he came in contact with indirect fire while on patrol during combat operations. Davis was assigned to the 1st Battalion, 32nd Infantry Regiment, 3rd Brigade Combat Team, 10th Mountain Division (Light Infantry), Fort Drum, New York. The circumstances of the soldier's death are under investigation as a possible friendly-fire incident. Media with questions about this soldier can call the Army Public Affairs Office at 703-692-2000. As she sat on her living room couch yesterday, surrounded by dozens of photos of her son, who was just killed in Afghanistan, Patricia Davis shed no tears. In fact, the strangest thing about the trim townhouse in Gaithersburg with the yellow ribbon on the tree in the front yard was that there were no sounds of mourning at all -- only laughter. She believed that is the way her only child, Private First Class Justin Davis, would have wanted it. The 19-year-old graduate of Colonel Zadok Magruder High School was a brash, outgoing young man so enthusiastic about kung fu movies and crunk rap music that he made his own videos and recorded his own songs. In his Web site on MySpace.com, he wrote that his heroes were God, Martin Luther King Jr. and Bruce Lee. He also was just plain large. Before he went to Army basic training after graduating in 2005, the hefty, 5-foot-10 running back sprinted around the neighborhood and wrapped himself in plastic to sweat off the last few pounds he needed to qualify. It was a decision he had reached during a one-year stint at the Hargrave Military Academy in Chatham, Virginia, relatives said yesterday. In the Army, he found a happy home, they said. He enjoyed the physical exertion, the excitement, the respect that wearing a uniform brought. When he came home, he'd visit Magruder High wearing fatigues and a tight T-shirt to show off both his muscles and what he'd become. "I don't mind you going in, but I wish it wasn't wartime," Patricia Davis recalled telling him. "Mom, you should've had more kids," he answered. 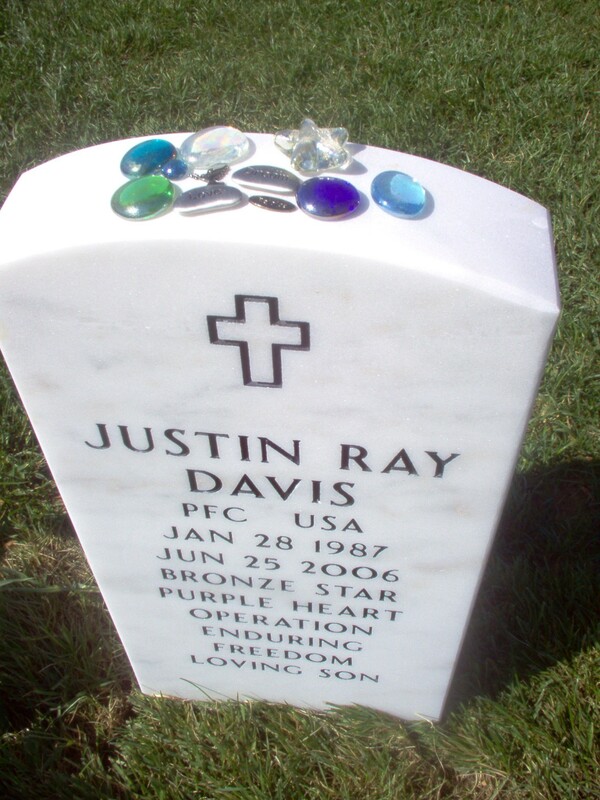 Despite his ample self-regard, Justin Davis was recalled by relatives and friends as an unusually thoughtful young man who remembered not only to call his mother on Mother's Day but also his aunt. One of his last telephone conversations home was June 24, to give birthday greetings to a friend. "I don't have long to talk. I'm going out on a mission," his mother remembered him telling the friend. Davis was killed later that day. The military has not released much information about the circumstances, saying only that two soldiers were killed in action June 24 in the Panjwayi district of Kandahar province in southeastern Afghanistan, an area that is a hotbed of Taliban activity. His mother and cousin said that the deaths are still being investigated because of the possibility that they were caused by friendly fire. Defense Department officials also announced yesterday that Army Private First Class Michael Joseph Potocki, 21, of Baltimore died Monday after he came under fire while on duty protecting a military command center in Iraq. "He was on the rooftop providing security at the task force operation point when he took on enemy small arms fire," Army spokesman Major Nathan Banks said. "He was in the Anbar province of Iraq. He was initially treated on the scene and then transported by medevac to a surgical unit in Al Asad, where he later died." Banks said that Potocki was an infantry soldier in Bravo Company of the 1st Battalion, 6th Infantry Regiment, 2nd Brigade Combat Team of the 1st Armored Division, headquartered in Baumholder, Germany. "Doin a lot of stuff cant really talk about . . . did some missions wit the CIA n other stuff jumpin outta helicopters you know doin the real job" -- unlike, he joked, his cousin Sergeant Josh Spencer, who is an Air Force satellite communications specialist who has served two tours in Iraq. In another e-mail home, his mother remembered, he said "the Afghan people are cool" and promised to bring a teapot home for his mother. After serving his time in the military, he wanted to go to UCLA and become an actor, she said. By yesterday afternoon, his MySpace Web page was flooded with tributes from friends from middle and high school and the short life he led afterward. "I'll always have a spot in my heart for my amazingly fat, but still amazingly perfect big man," a woman named Melissa wrote. "God took you cuz he needed another angel to watch over us all," someone named Jilliepoo wrote. His mother, wearing a black and yellow Army T-shirt, expressed barely a trace of regret. She said she will miss the noise he brought to her quiet house: the television, the music, the stomping up and down the stairway. "As much as I'm going to miss him . . . I know he died doing what he loved," she said. "I could have cried and begged him not to go, and he probably wouldn't have, because he loved his mom. But then he would have been miserable, and I would have been miserable because I would have known I was making him miserable." 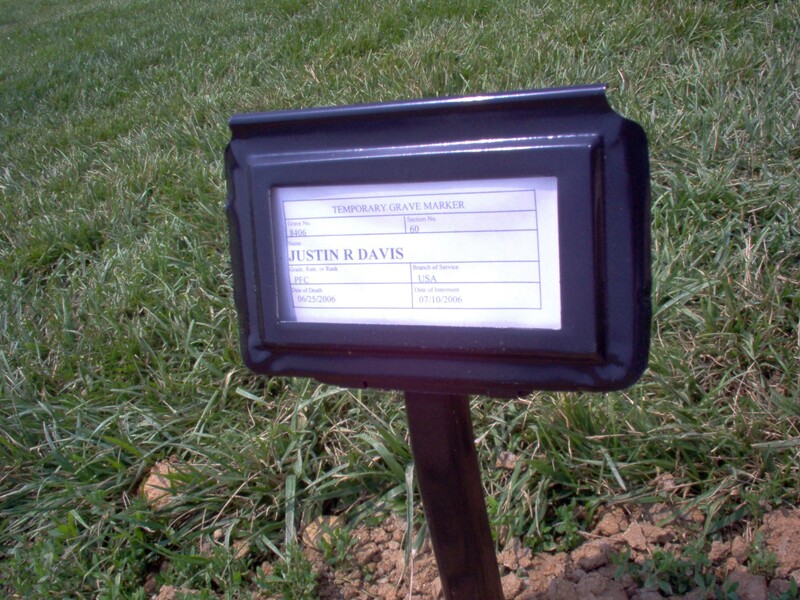 Davis will be buried at Arlington National Cemetery on July 16, 2006. "As weird as it sounds, that would have been a dream come true to him," his mother said. The U.S. military on Saturday said it was investigating the death of a soldier in eastern Afghanistan as a possible "friendly fire incident." 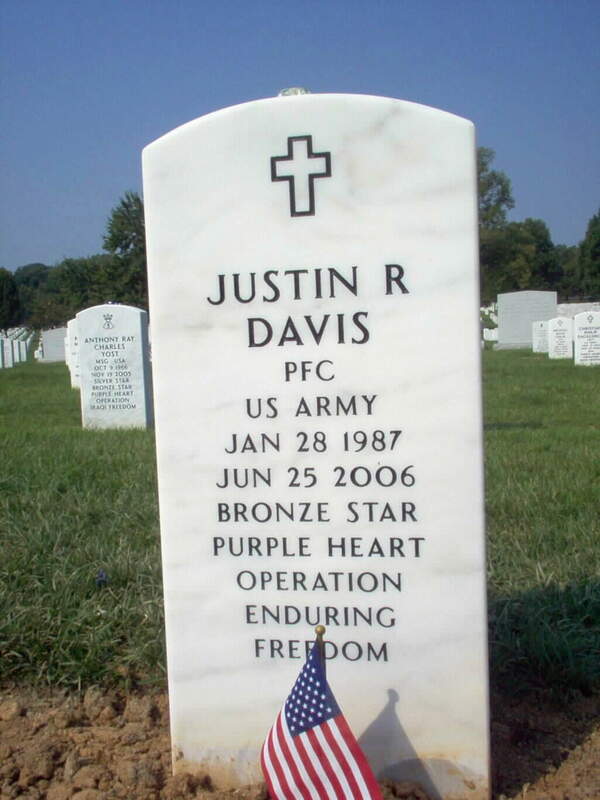 The Defense Department said Private First Class Justin R. Davis, 19, of Gaithersburg, Maryland, died on June 25, 2006, in eastern Kunar province when he came in contact with indirect fire - a term used for mortar shelling - while on patrol during combat operations. "The circumstances of the soldier's death are under investigation as a possible friendly fire incident," the statement said. In Afghanistan, the U.S.-led coalition released a statement saying an investigation into the incident is under way. "We are looking into Private Davis' death to determine what happened. No final determination has been made and we will not release any information relating to the investigation till it is complete," the statement said. Davis had been assigned to the 1st Battalion, 32nd Infantry Regiment, 3rd Brigade Combat Team, 10th Mountain Division based in Fort Drum, New York. 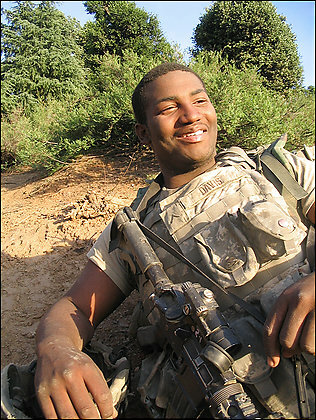 His mother, Paula Davis, told The Frederick News Post that Davis "was passionate about joining the service. "He would always say, 'This is my dream. I am going to follow it,'" Paula Davis told the newspaper. "He died doing what he loved." Justin Davis had been in Afghanistan since March and had plans to come home for several weeks in August. "It was a calling," she said. "It was a life that fit him." 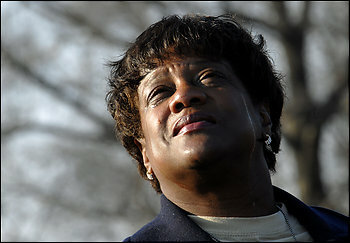 Davis' body arrived at Dover Air Force Base in Delaware on Tuesday, Paula Davis said. 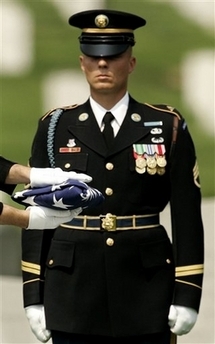 He will be buried in Arlington National Cemetery with full military honors July 10, 2006. Coalition troops have been operating in eastern Afghanistan to battle insurgents active along the Pakistan border. According to U.S. Army data earlier this year, 17 soldiers have died from friendly fire in the past four years - 10 in Iraq and seven in Afghanistan. They occurred in 11 separate incidents. The most famous case was the 2004 death of former NFL player Pat Tillman, an Army Ranger and corporal, who died during a gunbattle near the Pakistan-Afghanistan border. That case triggered a criminal investigation that is still pending. The U.S. military on Saturday said it was investigating the death of a Maryland soldier in eastern Afghanistan as a possible "friendly fire incident." The Defense Department said Private First Class Justin R. Davis, 19, of Gaithersburg, Maryland, died on June 25 in eastern Kunar province when he came in contact with indirect fire -- a term used for mortar shelling -- while on patrol during combat operations. "He would always say, 'This is my dream. I am going to follow it,"' Paula Davis told the newspaper. "He died doing what he loved." According to U.S. Army data earlier this year, 17 soldiers have died from friendly fire in the past four years -- 10 in Iraq and seven in Afghanistan. They occurred in 11 separate incidents. This was just how Army Private First Class Justin R. Davis wanted to go, borne to his appointed place in Arlington National Cemetery by an honor guard amid the measured salutes, mournful music and solemn ceremony reserved for fallen soldiers. Of that, his mother was convinced. "This would be a dream come true for him," Paula Davis of Gaithersburg said after she watched her big, brash 19-year-old son buried yesterday. "That's what he wanted to be: a hero." She has the hard evidence of her son's heroism even if she does not have answers about his death June 25, which the Defense Department is investigating as a possible friendly fire incident. In addition to the Purple Heart for being wounded in battle, her son was posthumously awarded a Bronze Star for his service with the 10th Mountain Division in Afghanistan, where he had been deployed since March. The Defense Department said he was killed by indirect fire, which often refers to mortar attacks, while on patrol in eastern Kunar province. Military officials gave the medals to his mother and his father, Dennis Johnson, in a ceremony before the burial. The citations did not describe the incidents in which he earned them. Davis said she had been told that he was in a "hostile environment" but did not know what happened. "Either way, it doesn't make any difference to me," she said after the ceremony. "It's not going to bring my boy back. If it was friendly, it wasn't intentional." She was more interested in remembering her only child, a 2005 graduate of Colonel Zadok Magruder High School who seemed destined to join the military. 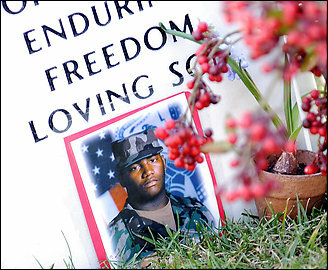 When he was young, he loved the beat of the song "I Am a Soldier in the Army of the Lord," his mother remembered. And as he grew, he craved the excitement, self-discipline and respect he thought being a soldier would bring. "I don't want for the world to forget about him. He's a brave, courageous young man," she said. "He would tell me, 'Man up, Mom.' I can't man up. I'm a girl!" Yet she bore her loss with stoicism. 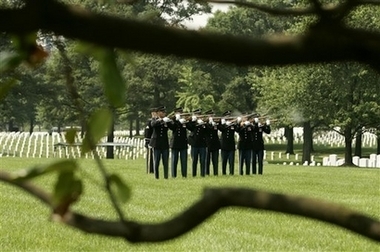 More than 100 friends and relatives in attendance had been upbeat waiting inside the cemetery's main administrative building, but the life seemed to drain out of them as they left their cars and trudged across a field of bright green grass, following the quick tramp of an honor guard that carried Davis's coffin from a hearse. His immediate family settled into a handful of chairs as the others crowded close. The Rev. Leon Grant of Mount Calvary Baptist Church in Rockville read from the Bible: "The trumpet shall sound and the dead shall be raised incorruptible." Gunshots rang in the distance from another funeral. "O death, where is thy sting?" The Rev. 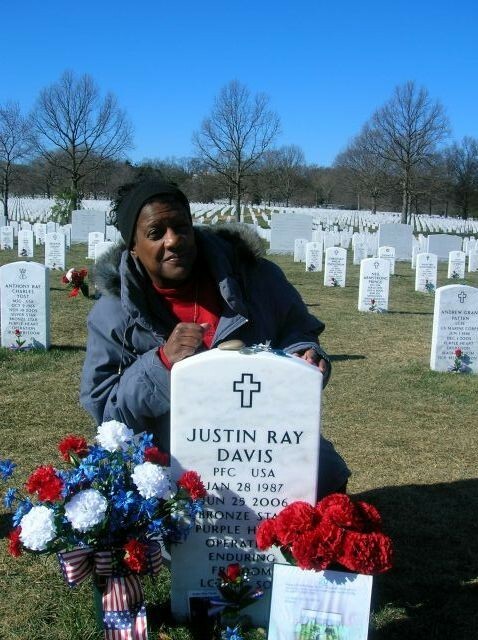 Hiawatha B. Fountain, the assistant pastor, continued: "Justin Ray Davis, you fought the good fight. You kept the faith. You finished the course." Friends and relatives nodded, saying in low voices: "Yes. Yes." The honor guard rapped out three salvos. As the bugler played taps, many in the crowd began sniffling and crying. Paula Davis's head was bowed, her eyes shut tight. 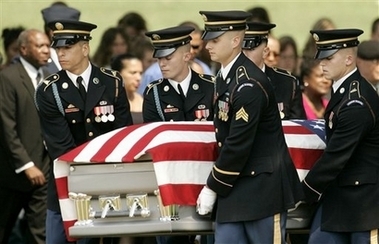 The soldiers before the coffin folded the flag on top of it into a neat triangle of stars. 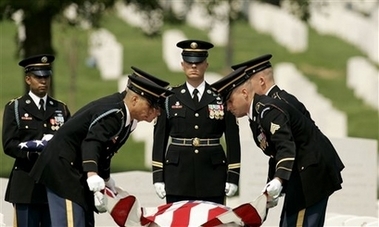 A soldier presented the flag to his sergeant; the sergeant to Maj. Gen. Jeffrey A. Sorenson, the senior officer there; the general to the mother, who accepted it with a stifled cry. 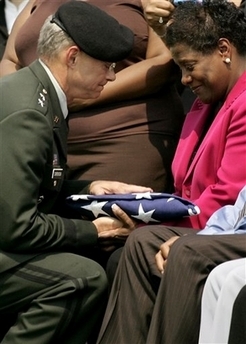 The general whispered a few words to her, and the soldiers gave another flag to Davis's father. A woman announced that the ceremony was over. Paula Davis rose from her seat to touch the coffin. After a long moment she walked away. She rushed back, touched the silver coffin again, then tore herself away. And with that, Justin Davis joined the serried ranks of the dead. They held hands, read poetry, prayed and sang "Happy Birthday," a song that was both sad and celebratory. Today would have been a momentous occasion -- turning 21 -- but, in the chill yesterday afternoon, there were only memories beside a soldier's grave. 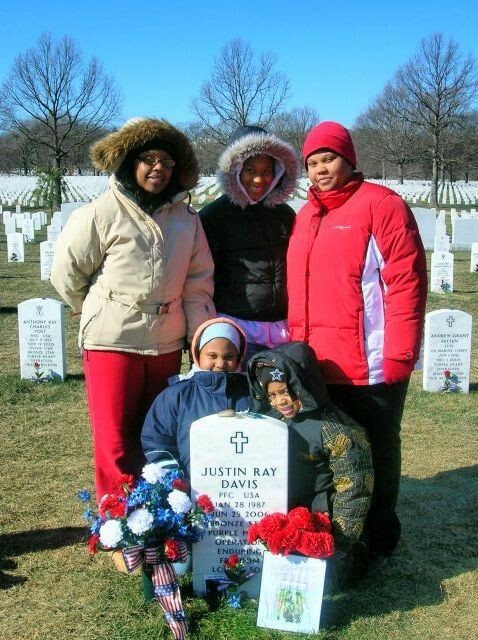 Private First Class Justin Davis was killed in Afghanistan when he was 19. Paula Davis did not want to let the milestone pass without a fitting remembrance of her only child. So 30 friends and relatives joined her at the white marble headstone in Section 60 of Arlington National Cemetery that bears her son's name. They recalled his spirit, his love for the Army. They talked of celebration and yet could not help but choke back tears. At the end, they released 21 balloons into the pale January sky and watched in silence as the brightly colored orbs drifted up from orderly white rows of military gravestones. "Because God lives, I know Justin lives on," said his aunt, Penny Spencer, who was in the delivery room the day he was born. "He lives in our hearts. He lives in the wind. . . . He lives everywhere." The occasion was not unlike other tributes by relatives left behind who mark anniversaries and holidays. 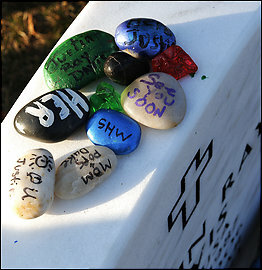 Yesterday's birthday party brought together people who covered the range of Justin's life. There was a cousin he had grown up with, Ashley Davis, 23, who recalled eating watermelon with him and wondering whether the seeds they spit out would produce new melons. There was a friend from Magruder High School in Rockville, where Justin played football and helped Tyler Murray, 19, get back on track when he was slipping in his classes. "He was like a brother to me," Murray said. There was his Army recruiter, Sergeant First Class Luke Newman, who recalled the day he met Justin, with his "million-dollar" smile and cool confidence, in a high school classroom. And the day he learned that Justin had died in Afghanistan. "It devastated me," he said, his voice breaking. His grief melded with guilt, he said, as he placed a phone call to Justin's mother. "I felt like it was my fault," he said. Paula Davis, he recalled, did not see it that way. "She assured me that there was no ill will and Justin died doing what he loved," Newman said. Tre talked about how Justin wrestled with him. Barbara Davis recalled the comfort of his bear hugs. 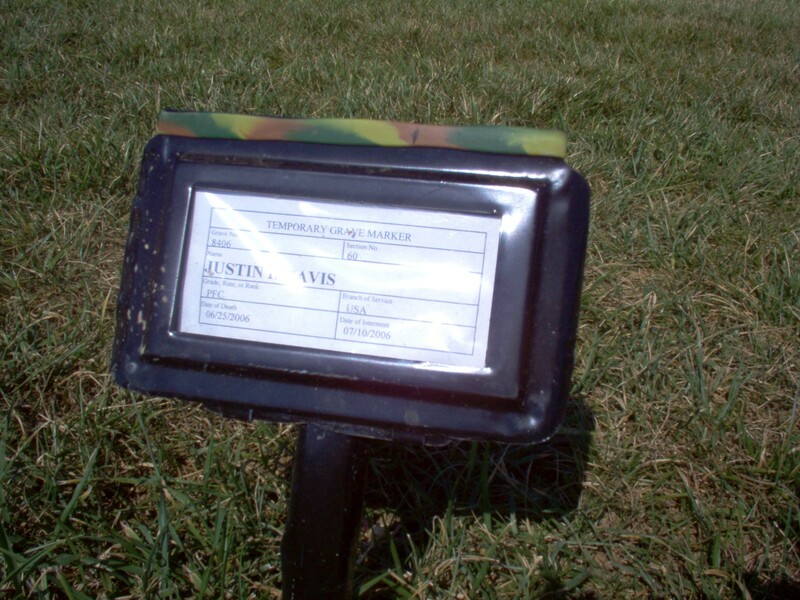 The soldier, who was in the 10th Mountain Division and aspired to be part of a Ranger unit, was killed in June 2006 by mortar fire. His mother said the Army told her it was a friendly fire incident. His mother described him as big and brash and yet so friendly that "he never met a stranger." Davis, 52, read aloud a letter Justin wrote after leaving his home in Gaithersburg for boot camp. The letter began, "Hey, Mom, how's life without your boy?" It went on to thank her for all she had done, raising him as a single mother. "You have loved me and cared for me and turned me into a man by yourself." She read this beside his headstone, which was decorated with roses, carnations and little rocks painted by an 8-year-old cousin with words including "hero." Woody Johnson, an uncle, said it did not feel as if so much time had passed since the day the family learned Justin had been killed. His 21st birthday is hard, Johnson said. But, he added, "It's always hard." After the birthday balloons were released -- a gesture his mother felt Justin would have appreciated -- Davis thanked the others for sharing the day. Everyone was invited for birthday cake and some of his favorite dishes, including fried chicken, potato salad and jambalaya, at her home in Gaithersburg. "We don't want the world to forget about our children," she said. "That's the thing we fear the most: that people will forget about all of these men and women who gave the ultimate sacrifice." 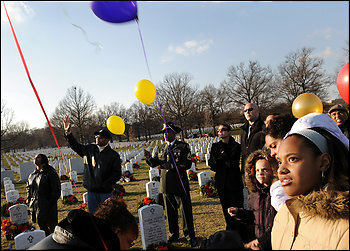 Friends and relatives release 21 balloons at the grave of Pfc. ustin Davis. float over Arlington National Cemetery. He was her only child.